For Today’s Photography Tip I’m posting two photos in order to give a quick demonstration on the difference between two file formats used by Digital Photographers in the field. They are JPG and RAW. I shoot RAW files, exclusively. In the past, pretty much only professional photographers or really serious hobbyists would bother using RAW when taking pictures. Nowadays, lots of people are getting into the act. Until recently RAW files weren’t available in Point and Shoot models, only in your larger DSLR cameras. Canon is now manufacturing a Point and Shoot which can make RAW photos. You can bet on it, everyone will follow suit. 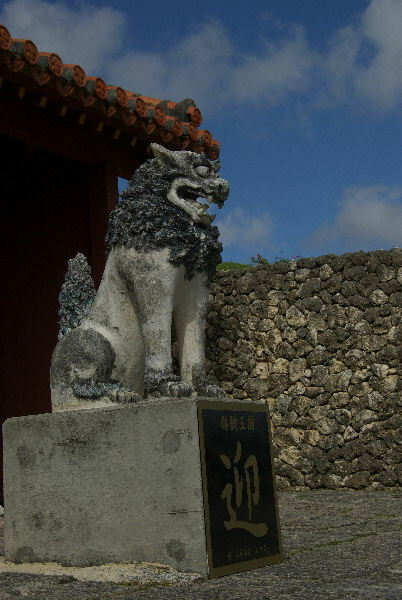 The dark photo of an Okinawan Shisa (Lion-dog) posing under a red-tile roof with blue skies is an example of what a RAW photo looks like. It looks dark, way underexposed, almost like one of those old-fashioned film negatives from the 20th Century. And, so it is; it’s raw and needs to be developed. The photo in which the Shisa is clearly visible is a JPG file. You can Google to find out more about the different types of files most commonly used with digital cameras today, but my quick explanation may help you decide which format is best for you. 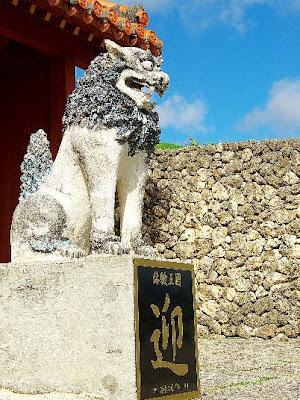 JPG files, when copied, loose some of their details each time you copy them. If you’re just shooting for your own personal use or scrapbooking, JPG files are the way to go. RAW files allow you more flexibility in creating JPGs. From a RAW file, you can create 100’s of JPGs, every one different from the one before it. The trade-off being, you have to develop every shot after you download your camera. If you’d have shot JPG’s, the camera would’ve developed them for you. In a nutshell: RAW lets you be a bit more creative, artistic, flexible in what you do after the camera is downloaded, but makes more work for you and creates the need for more storage of files. JPG’s are just fine for most photographers who are not getting into commercial production with their photography. RAW shots allow you to interpret the information your camera’s computer has saved a bit differently than the manufacturer of your camera does when it creates the JPG. If you found this Photography Tip helpful please, feel free to leave a comment or question below. JOIN MY FACEBOOK FAN CLUB BY CLICKING THE GADGET ON THE RIGHT AND WE CAN PLAN THE NEXT 100 PHOTOGRAPHY TIPS, EVEN FILL-UP A BOOK WITH THEM ! Thanks for the tip. We have struggled deciding on whether to use RAW or JPEG. The challenge with RAW has been the size of the file for us. While we traveled we decided to stick with JPEG, in order to save us time developing and storage space. But, of course we are limited in editing our photos. Sometimes, for a short deadline, I'll still do JEPGs but, still keep the RAWs for me to work on later. I get to keep the best, that way ! Storage, even when traveling, can be done with some of the gadgets available nowadays. I also only shoot in RAW+small jpeg and love spending hours squeezing the creative juice out of me in Lightroom with all the files I got. Glad to hear someone enjoys the hours in front of the monitor. I really don't get a kick out of that part of production but, it does beat the heck out of waiting for development of film or, worse yet, having to mess with the hazardous materials to develop yourself !